An application has to have a compelling reason to exist—otherwise even the smartest technology can end up looking silly and ineffective. (How about that bluetooth toaster?). Artificial intelligence can drive value for your business and your customers only to the extent that you’re using it to solve the right problems in the right way. Otherwise, you risk looking like a trend-chaser with a poor understanding of either your customers’ needs or the true value of data science. That makes choosing the right applications to focus on a critical element of your AI initiative. Is this an important, unsolved customer problem? Can we, and our partners if needed, solve it well? Do we have a way to build durable competitive advantage for our solution? If the answer to all three questions is yes, you’re well positioned for success. CDI has long been deeply woven into the culture of Intuit. Our founder, Scott Cook, began by looking at highly successful products—both our own and others—and thinking about what they had in common. The CDI model he codified is now part of the training we provide to every one of our employees, from new hires to senior product designers and developers. As we design, prototype, experiment, and test products at studios around the world, CDI ensures that we’re deploying our resources to the best advantage of our customers. That’s especially valuable in the era of AI, when the rapid evolution and vast potential of data science can make it all too easy to spread yourself too thin or lose customer focus. The first CDI question is fairly obvious to ask—are we solving a problem that our customers need to be solved? Likewise for the second question; companies usually consider their capabilities and core competencies as well. But if you’re seeking to reinvent your business for the future, or to continue a long-term journey of innovation, the ability to build durable advantage is critical. That’s where AI and machine learning come into play. By building expert intelligence into your systems, you can create differentiated solutions that can’t easily be duplicated or surpassed by your competitors. A high level of personalization further strengthens your position by deepening customer loyalty and retention. The application of AI within Intuit’s tax products illustrates CDI in action. It’s easy to make the case that individuals, households, and small businesses need help getting their taxes done. The U.S. tax code amounts to more than 80,000 printed pages and thousands of compliance forms, all based on tens of thousands of underlying tax concepts and a large number of intertwined relationships. Filing taxes with a high degree of precision and accuracy is critical—even as a filer’s particulars change significantly from year to year. It’s no wonder U.S. taxpayers spend an estimated seven billion hours each year on tax compliance. Can we solve it well? To solve the tax preparation problem for customers, a company needs both deep expertise in the tax code, and the technological depth to put this expertise to work in the right way for customers. The first qualification is part of Intuit’s core DNA; this is clearly the kind of problem that it’s our mission to solve. With a culture of innovation dating back to the early days of the online era, Intuit can also leverage the latest technological advancements in the solution we deliver. Given the vast size of the U.S. tax code, Intuit’s expertise in AI is critical for accelerating development. By incorporating deep learning, statistical learning, and natural language processing into expert systems, we can internally represent the rules that make up the tax code more quickly, accurately, and efficiently than would be possible through traditional coding. The resulting tax knowledge graph, combined with the user data customers have given us permission to use, forms a tax knowledge engine that delivers the information our customers need to be confident that they’re complying fully with the tax code while getting the maximum refund to which they’re legally entitled. That’s what a good tax solution looks like. Can we build durable advantage? The essence of competitive advantage is the ability to meet customers’ needs better than anyone else. The scope and complexity of the tax systems Intuit has built give us that durable edge. We’ve built systems that can ingest that entire 80,000-page U.S. tax code, convert it into computer code, and make AI-based tax preparation easily accessible to customers with a simple, intuitive user experience. Even at Intuit, this effort took years of work by many, many people; a competitor would need to undertake a similar effort to even hope to approach the level of our solution—and in the meantime, Intuit continues to lengthen our lead by simplifying and personalizing the experiences we provide. Machine learning is already making it possible to reduce the number of questions a customer has to answer. Considering factors such as college expenses, charitable donations, and retirement plans, our tax knowledge engine can predict and validate the user’s tax situation based on what we already know about them and similar filers for a faster, simpler tax experience. As we continue our AI journey, we’ll further iterate and tune the algorithms, data, and flows that make up our systems to deliver even better results for our customers. 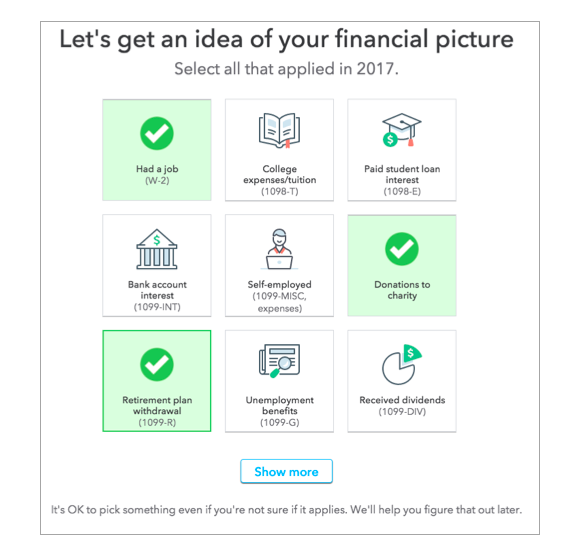 Tax preparation is clearly an ideal area for Intuit to pursue AI initiatives. What’s the AI sweet spot for your business? In the next blog in this series, we’ll look at how you can accelerate efforts like these with speed and scale.